1. Vertical belt drive should be avoided. 2. In horizontal belt drive the upper side should be kept as loose side. 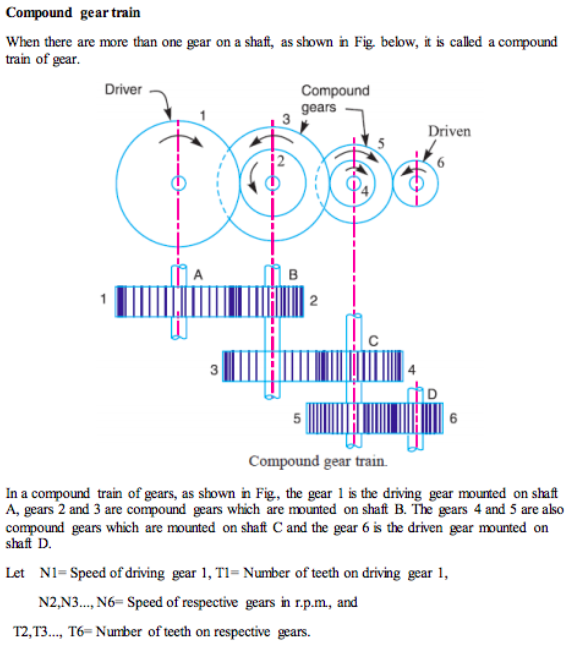 Law of Gearing: The law of gearing states that the angular velocity ratio of all gears of a meshed gear system must remain constant also the common normal at the point of contact must pass through the pitch point. Find the width of the belt, necessary to transmit 7.5 kW to a pulley 300 mm diameter, if the pulley makes 1600 rpm and the co-efficient of friction between the belt and pulley is 0.3. 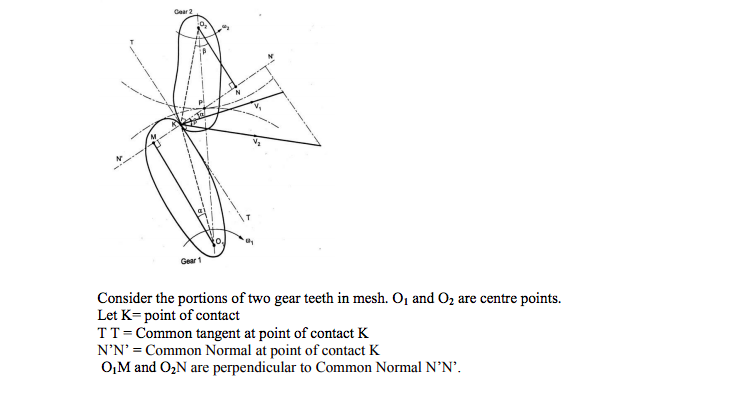 Assume the angle of contact as 180o and the maximum tension in the belt is not to exceed 8 N/mm width. 1. The V-belt drive gives compactness due to the small distance between the centres of pulleys. 2. The drive is positive, because the slip between the belt and the pulley groove is negligible. 3. Since the V-belts are made endless and there is no joint trouble, therefore the drive is smooth. 4. It provides longer life, 3 to 5 years. 5. It can be easily installed and removed. 6. The operation of the belt and pulley is quiet. 7. The belts have the ability to cushion the shock when machines are started. 8. 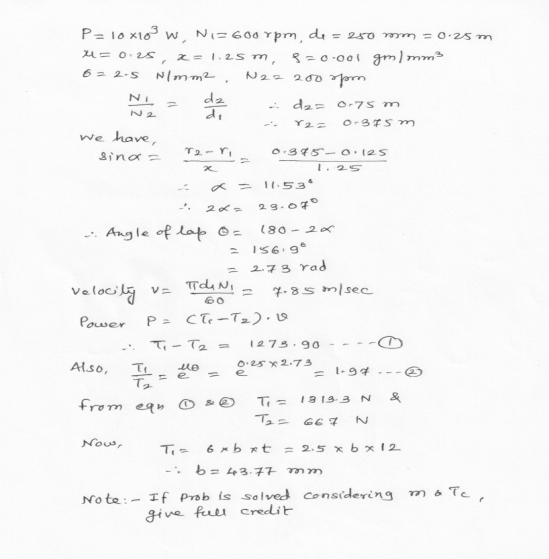 The high velocity ratio (maximum 10) may be obtained. 9. The wedging action of the belt in the groove gives high value of limiting ratio of tensions. Therefore the power transmitted by V-belts is more than flat belts for the same coefficient of friction, arc of contact and allowable tension in the belts. 10. The V-belt may be operated in either direction with tight side of the belt at the top or bottom. The centre line may be horizontal, vertical or inclined. A leather belt is required to transmit 7.5 kW from a pulley 1.2 m in diameter running at 250 rpm. The angle of contact is 165o and the co-efficient of friction between the belt and the pulley is 0.35. If the safe working stress for the leather belt is 2 MPa, density of leather is 1050 kg/m3 and the thickness of belt is 10 mm, determine the width of belt, taking centrifugal tension into account. 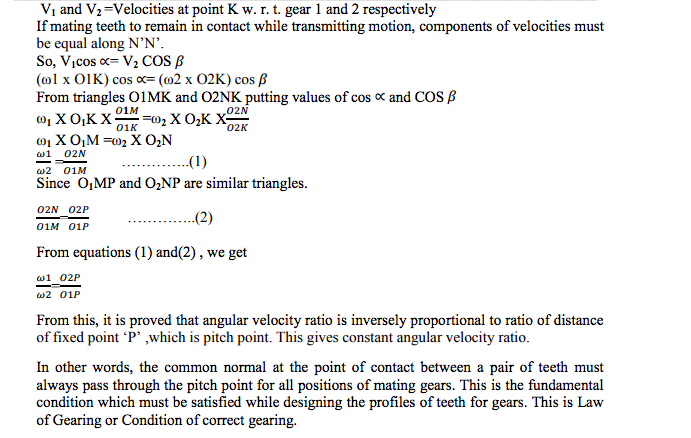 c) Law of Gearing: The law of gearing states that the angular velocity ratio of all Gears of a meshed gear system must remain constant also the common normal at the point of contact must pass through the pitch point. A flat belt drive is required to transmit 35 kW from a pulley of 1.5 m effective diameter running at speed of 300 rpm. The angle of contact is spread over 11/24 of the circumference co-efficient of friction for the surface is 0.3. 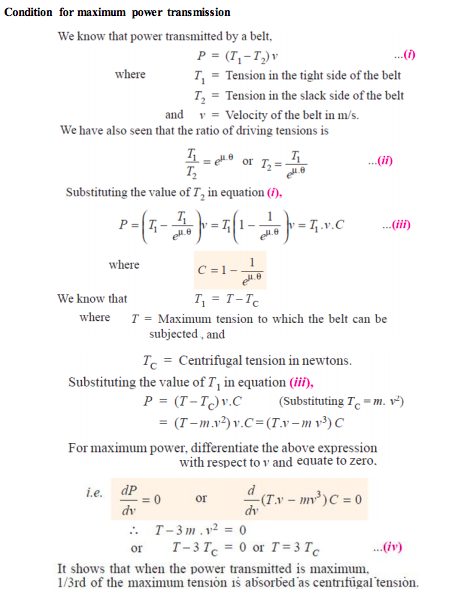 Determine the maximum tension in the belt. Define slip and creep in the belt drive Slip --- Slip is defined as insufficient frictional grip between pulley (driver/driven) and belt. Slip is the difference between the linear velocities of pulley (driver/driven) and belt. Creep ----- Uneven extensions and contractions of the belt when it passes from tight side to slack side. There is relative motion between belt and pulley surface, this phenomenon is called creep of belt. a) No slip takes place in chain drive as in belt drive there is slip. b) Occupy less space as compare to belt drive. 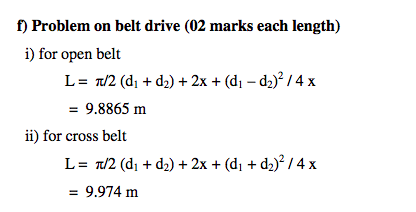 d) More power transmission than belts drive. e) Operated at adverse temperature and atmospheric conditions. g) Used for both long as well as short distances. Two pulley, one 450 mm diameter and the other 200 mm diameter are on parallel shafts 1.95 m apart and are connected by a crossed belt. 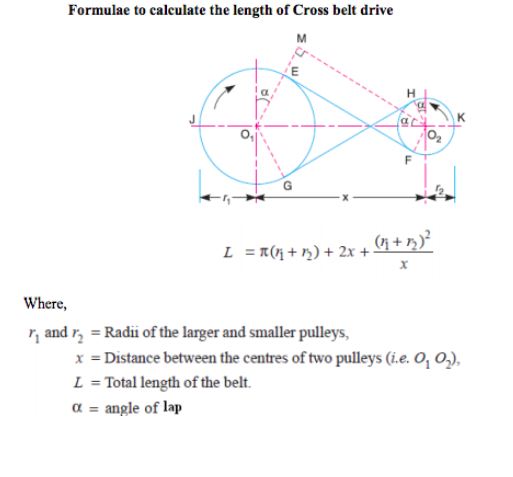 Find the length of the belt required and the angle of contact between the belt and each pulley. What power can be transmitted by the belt when the larger pulley rotates at 200 rpm, if the maximum permissible tension in the belt is 1 kN and the co-efficient of friction between the belt and pulley is 0.25 ? axis of gear A (i.e. O1), then the gear B is forced to rotate upon and around gear A. Such a motion is called epicyclic and the gear trains arranged in such a manner that one or more of their members move upon and around another member are known as epicyclic gear trains. Reverted Gear Train When the axes of the first gear (i.e. first driver) and the last gear (i.e. last driven or follower) are co-axial, then the gear train is known as reverted gear train. We see that gear 1 (i.e. first driver) drives the gear 2 (i.e. first driven or follower) in the opposite direction. 1. Manufacturing cost of chains is relatively high. 2. The chain drive needs accurate mounting and careful maintenance. 3. High velocity fluctuations especially when unduly stretched. 4. Chain operations are noisy as compared to belts. A shaft runs at 80 rpm & drives another shaft at 150 rpm through belt drive. The diameter of the driving pulley is 600 mm. Determine the diameter of the driven pulley in the following cases: (i) Taking belt thickness as 5 mm. (ii) Assuming for belt thickness 5 mm and total slip of 4%. Explain steep and creep phenomenon in belts. Slip of Belt:- Ans:- When driver pulley rotates firm grip between its surface and the belt. This firm grip between pulley and belt is because of friction and known as frictional grip. If this frictional grip becomes insufficient to transmit the motion of pulley to belt. Then there will be. 1) Forward motion of driver pulley without carrying belt called as slip on driving side. Creep of Belt:- The belt moves from driving pulley is known as Tight side and belt moves from driving pulley to driver pulley as slack side. Tension on both i.e. on tight sides and slack side is not equal ( T1> T2 ) . The belt material is elastic material which elongates more on Tight side than the slack side resulting in unequal stretching on both sides of drive. A certain portion of belt when passes from slack side to tight side extends and certain portion of belt when contracts, passes from tight side to slack side because of relative motion. The relative motion between belt and pulley surface due to unequal stretching of two sides of drives is known as creep. Slip --- Slip is defined as insufficient frictional grip between pulley (driver/driven) and belt. 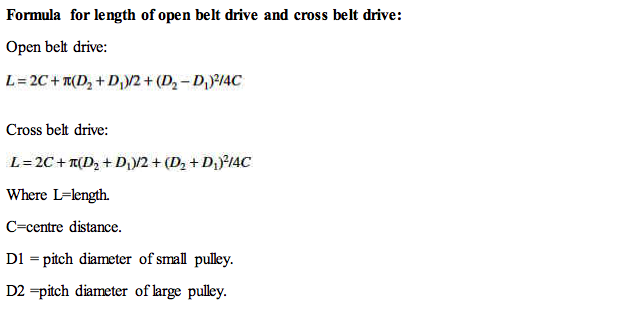 Slip is the difference between the linear velocities of pulley (driver/driven) and belt. Creep ----- Uneven extensions and contractions of the belt when it passes from tight side to slack side. There is relative motion between belt and pulley surface, this phenomenon is called creep of belt. As the belt passes over the pulley with high velocity, centrifugal force is produced on the belt, which tends to act on the belt. This force tries to move the belt away from the pulley. 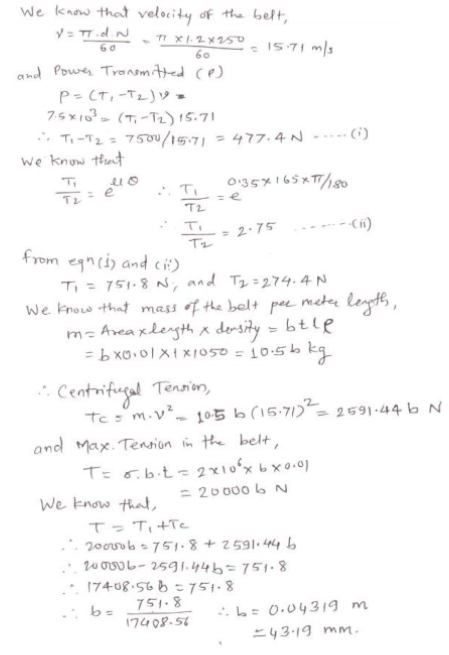 There is no effect of centrifugal tension on power transmitted. A pulley is driven by the flat belt running at speed of 600m/min. and transmit 4 kW. 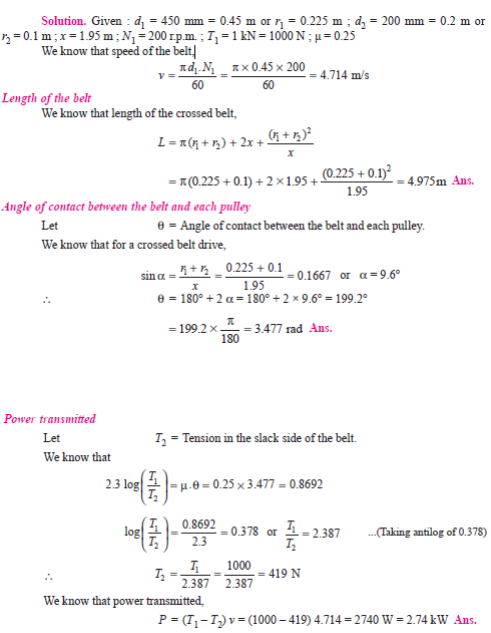 The coefficient of friction between belt and pulley is 0.3 and angle of lap is 160°. Find maximum tension in the belt. Power transmission in belt drive depends on angle of lap and frictional grip between belt and pulley. As slack side is at upper side angle of lap and grip increases. Slip of belt : The motion of belts and shafts assuming a firm frictional grip between the belts and the shafts. But sometimes, the frictional grip becomes insufficient. This may cause some forward motion of the driver without carrying the belt with it. This may also cause some forward motion of the belt without carrying the driven pulley with it. This is called slip of the belt and is generally expressed as a percentage. 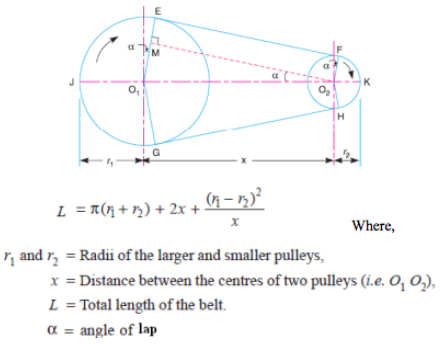 Angle of Lap : The angle of lap is defined as the angle subtended by the portion of the belt which is in contact at the pulley surface of the pulley. 2. Requirement of the high velocity ratio (maximum 10). When the driving shaft A is rotated, the flange C (link 1) causes the intermediate piece (link 4) to rotate at the same angle through which the flange has rotated, and it further rotates the flange D (link 3) at the same angle and thus the shaft B rotates. Hence links 1, 3 and 4 have the same angular velocity at every instant. A little consideration will show that there is a sliding motion between the link 4 and each of the other links 1 and 3. Slip of the belt: A firm frictional grip between belt and shaft is essential. But sometimes it becomes insufficient. This may cause some forward motion of the belt without carrying the driven pulley with it. This called as slip of the belt. It is expressed as a percentage. 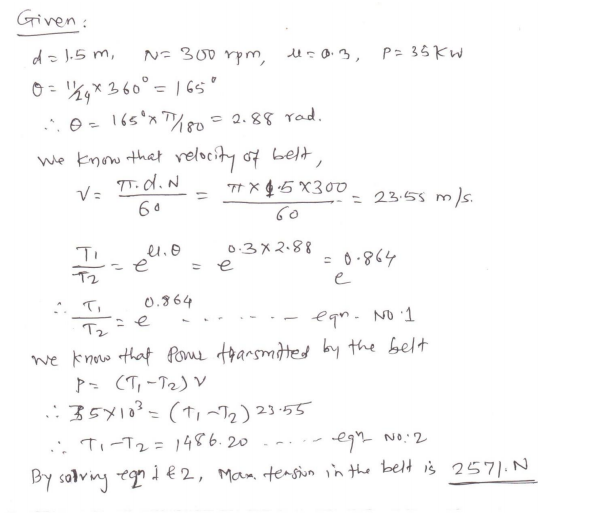 Effect on velocity ratio: Result of belt slipping is to reduce the velocity ratio of the system. Creep in belt drive : When the belt passes from slack side to tight side, a certain portion of the belt extends and it contracts again when the belt passes from tight sight to slack side. Due to these changes in length, there is a relative motion between the belt and the pulley surfaces. This relative motion is called as creep. 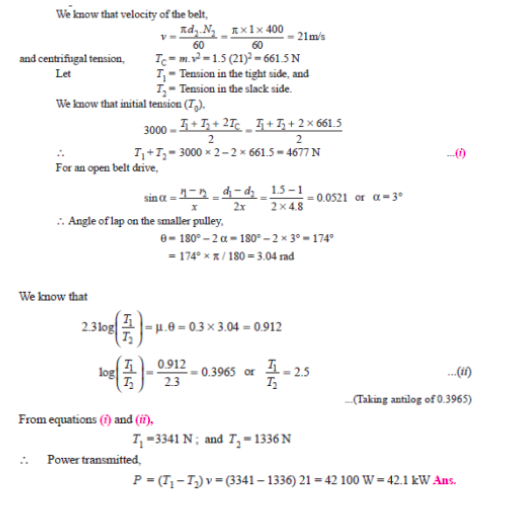 Effect on velocity ratio: The total effect of creep is to reduce slightly the speed of the driven pulley or follower. 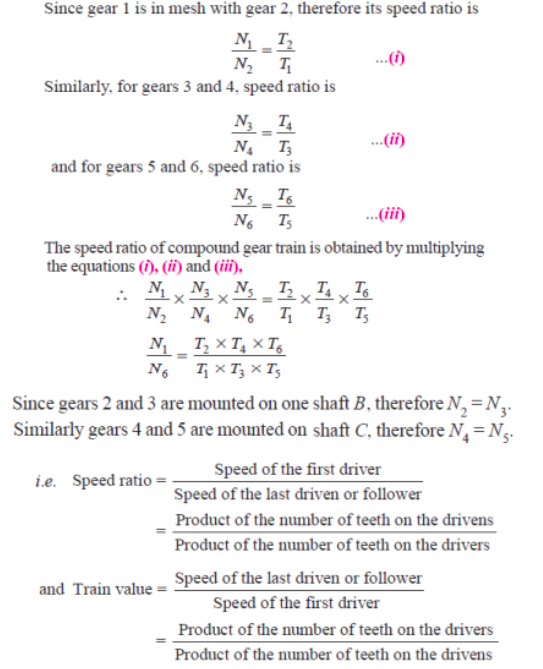 (i) Define ‘Gear Train’. State its purpose and types of gear train. 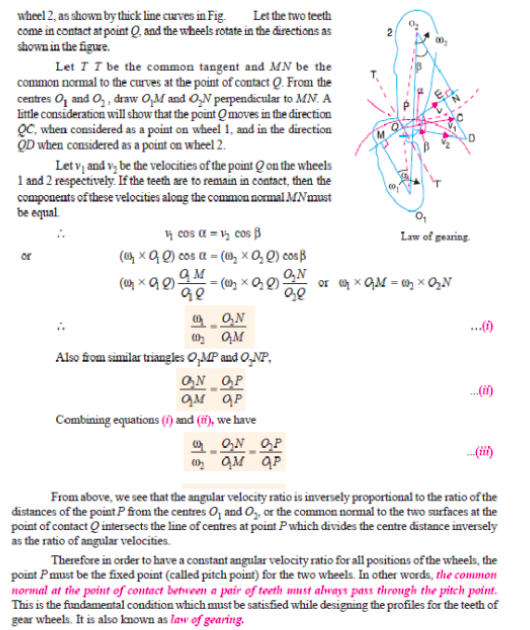 To obtain correct & required velocity ratio between driver & driven shafts. To decide upon the relative position of the axes of shafts. Slip : When the frictional grip becomes insufficient. This may cause some forward motion of the driver without carrying the belt with it. This may also cause some forward motion of the belt without carrying the driven pulley with it. This is called slip of the belt and is generally expressed as a percentage. Creep : When the belt passes from the slack side to the tight side, a certain portion of the belt extends and it contracts again when the belt passes from the tight side to slack side. Due to these changes of length, there is a relative motion between the belt and the pulley surfaces. This relative motion is termed as creep. Advantages -1. The V-belt drive gives compactness due to the small distance between the centres of pulleys. 4. It provides longer life of 3 to 5 years. In an epicyclic gear train, the axes of the shafts, over which the gears are mounted, may move relative to a fixed axis. A simple epicyclic gear train is shown in Fig. where a gear A and the arm C have a common axis at 1 about which they can rotate. 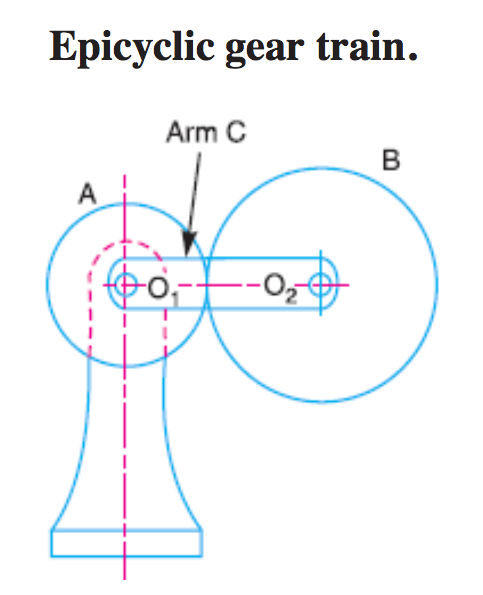 The gear B meshes with gear A and has its axis on the arm at O2, about which the gear B can rotate. 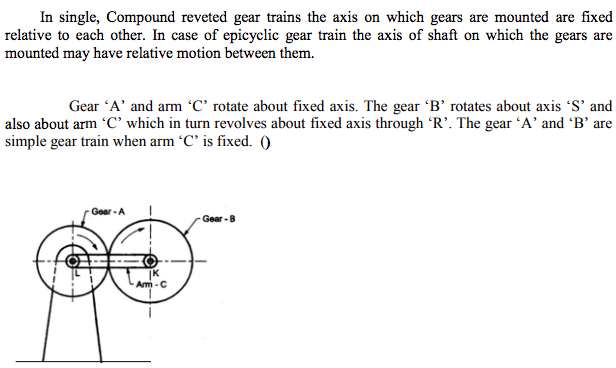 If the arm is fixed, the gear train is simple and gear A can drive gear B or viceversa, but if gear A is fixed and the arm is rotated about the axis of gear A (i.e. O1), then the gear B is forced to rotate upon and around gear A. Such a motion is called epicyclic and the gear trains arranged in such a manner that one or more of their members moves upon and around another member are known as epicyclic gear trains (epi - means upon and cyclic means around). 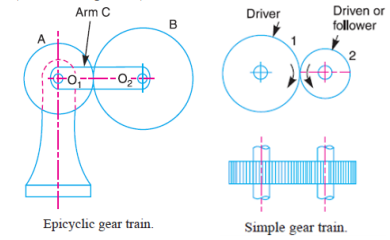 The epicyclic gear trains may be simple or compound. The epicyclic gear trains are useful for transmitting high velocity ratios with gears of moderate size in a comparatively lesser space. The epicyclic gear trains are used in the back gear of lathe, differential gears of the automobiles, hoists, pulley blocks, wrist watches etc. 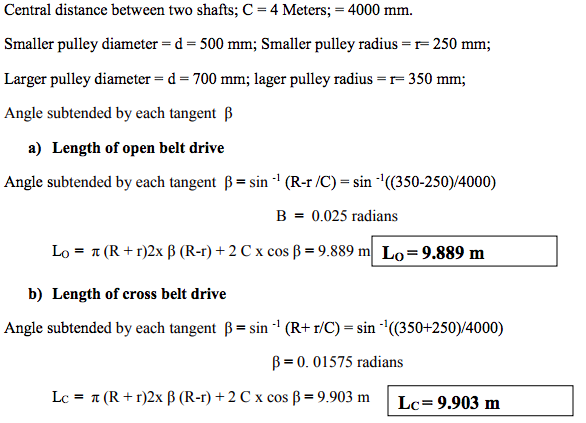 State the formulae to calculate the length of open belt drive and cross belt drive. State the meaning of each term by drawing suitable diagrams in both cases. What is centrifugal tension ? State its formula. Explain its effect on power transmitted by a belt drive. Two parallel shafts whose centre line are 4.8 m apart, are connected by open belt drive. The diameter of larger pulley is 1.5 m and that of smaller pulley 1 m. The initial tension in the belt when stationary is 3 kN. 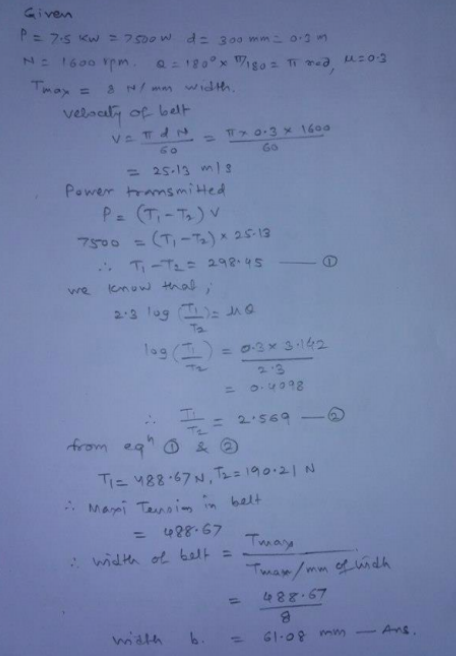 The mass of the belt is 1.5 kg/m length. The coefficient of friction between the belt and pulley is 0.3 Taking centrifugal tension into account, calculate the power transmitted when the smaller pulley rotates at 400 rpm.